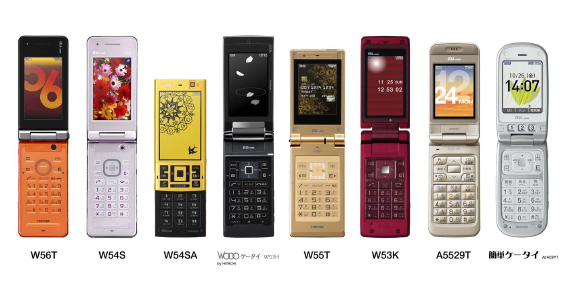 The fall and winter 2007 handset season is officially upon us now with au announcing their new series of models will hit the dori by middle of November. The latest line-up also claims one ‘world first’ with a co-op between Samsung and Hitachi, on the W53H – Wooo, touting a 2.8 inch QVGA organic EL display targeting users hooked on 1Seg digital-tv. More details with pics and links after the jump. The dedicated Flash site for this latest line-up is Here, we also noticed with interest the new W55T – Card Size Slim – a stainless steel plated unit which will is available in limited quantity of 3,000 units and can apparently only be purchased via the internet. All models are on display as of today at the always fashionable KDDI Designing Studio in Harajuku! Best effort machine translation of the extended details and key features Here. We expect to see a rush of next-generation offerings coming soon from DoCoMo (905i-series) and SoftBank Mobile as well.